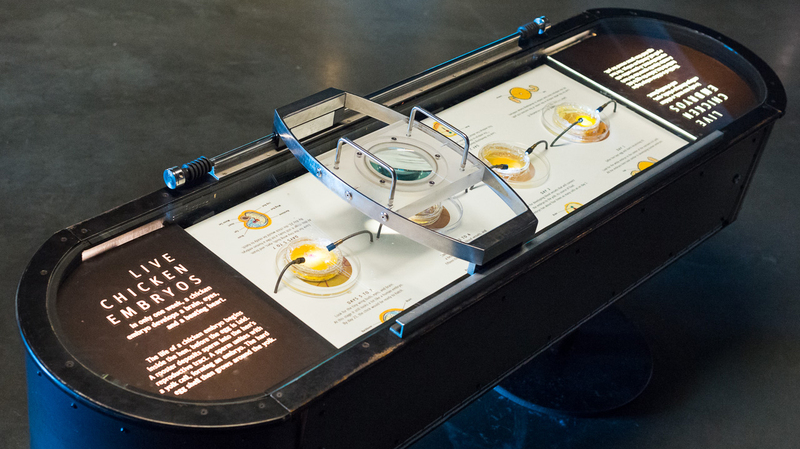 Begin your tour at the beginning—of life—with a close look at the insides of real live chicken embryos in various stages of development. It takes just 21 days for an egg to go from just laid to newly hatched, and a lot goes on in the first week. Look closely and you’ll find blood vessels, a backbone, wing buds, eyes, a brain, and—throbbing prominently by day 5 or so—a beating heart. The eggs we use in this exhibit come from a local farm. And when we find ourselves with too many eggs on hand? We take them home and eat them. Waste not, want not. Now that you’ve seen one up close, cross the road (er, hallway) and see if you can tell a chicken embryo from a human embryo at the Which Embryo Is Human? exhibit. And don’t feel bad—we all get it wrong. Take a microscopic tour of the wonderland of living creatures that take up residence on the pilings of our pier. It’s truly a journey of discovery, because exactly which critters happen to be on the plate today is anyone’s guess. Skeleton shrimp with eerie red eyes, barnacles grabbing for prey, the occasional polka-dotted nudibranch—it’s an exciting world in the briny bay beneath the museum. And the cast of characters changes with the seasons. 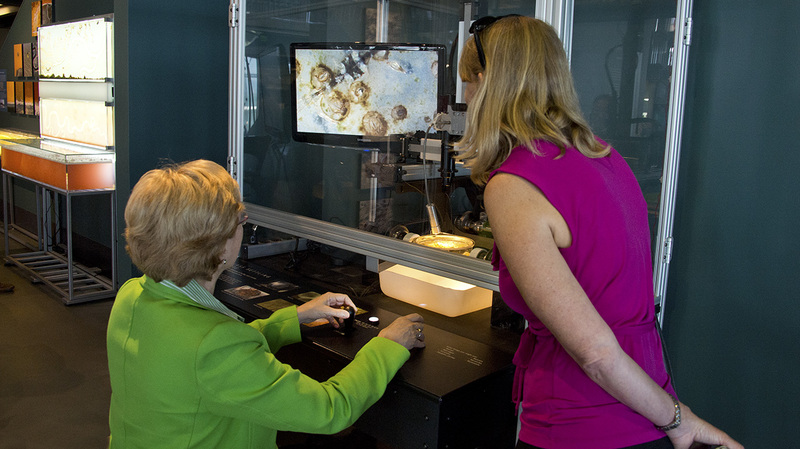 The best part is, you get to drive the microscope—that is, if you can manage to wrest control of the joystick at this extremely popular exhibit. A final tip: Don’t forget to flip over the plate and take a look at the underside. 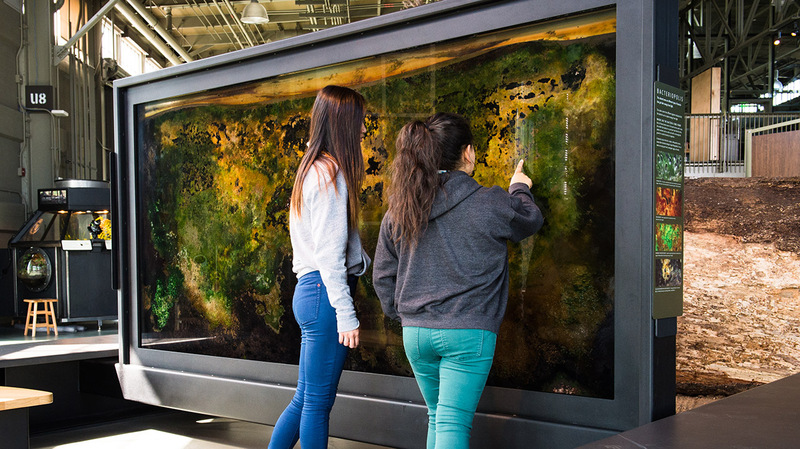 If you’ve been accused of lacking culture, here’s your chance to load up: There are thousands of distinct species living and breathing (or not) in this bacterial terrarium. To make this colorful culture, we mixed bucket loads of mud from a pond in Golden Gate Park together with eggs and toilet paper. Yum. The ultimate low-maintenance exhibit, it can live and thrive indefinitely, requiring only sunlight and the occasional addition of water. Look for green cyanobacteria, orange iron oxidizers, and grey cellulose-eaters. What you see today will be gone tomorrow in this living artwork in a perpetual state of change. 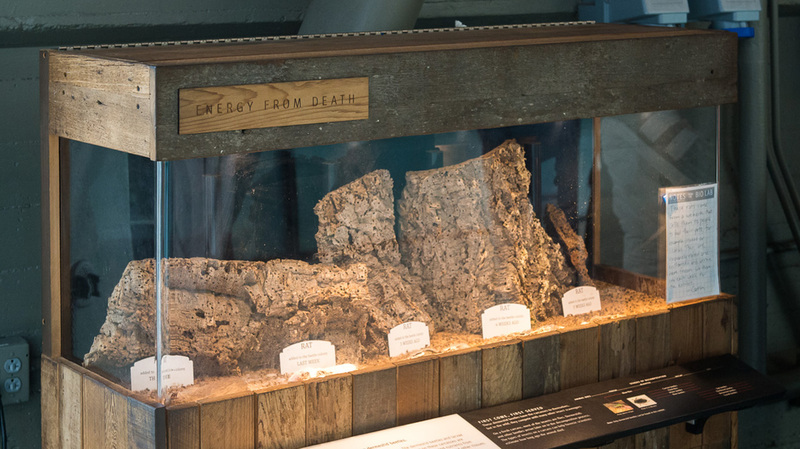 This exhibit is a giant version of a Winogradsky column. Try making your own smaller version at home. It’s not only easy, but a great excuse (if you needed one) to play with mud. And the final stop on our tour of life is, appropriately, death—oh, rats. Creature corpses of all stripes have found their way into this decay display: cats, rats, snakes, frogs. Most are pet food, purchased from a website and delivered frozen. Is there anything you can’t buy online? All good things—including this tour—must come to an end. C’est la vie. But repeat this tour on your next visit; you’ll probably notice plenty of changes. Life goes on.